Orlando, FL – It all began in the back of a friend’s café. Julie Shipley started cooking soup for her friend on a 3×4 table with 2 burners and a couple of pots but she always used the freshest ingredients and had a knack for adding just the right seasonings. And her soups were a hit! Pretty soon she was selling to other restaurants and needed to move to a larger facility. Within a year she was delivering her soups to 20 local restaurants each week. As can often happen with smart and able entrepreneurs, success breeds more success. Every week after cooking for the restaurants, Shipley had soup left over. She decided to “just see” what would happen if she opened her doors to the public and sold her soups in quart containers “to go.” Six months later she had expanded to her own store and had hired 9 employees. 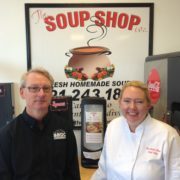 Her business, The Soup Shop, was up and running selling over 70 types of homemade soup with only the finest ingredients. Eventually Shipley stopped delivering to restaurants and focused on her retail operation. The first two years in the store were not particularly profitable but sales were good. In 2015 sales started to increase but profits were still illusive. 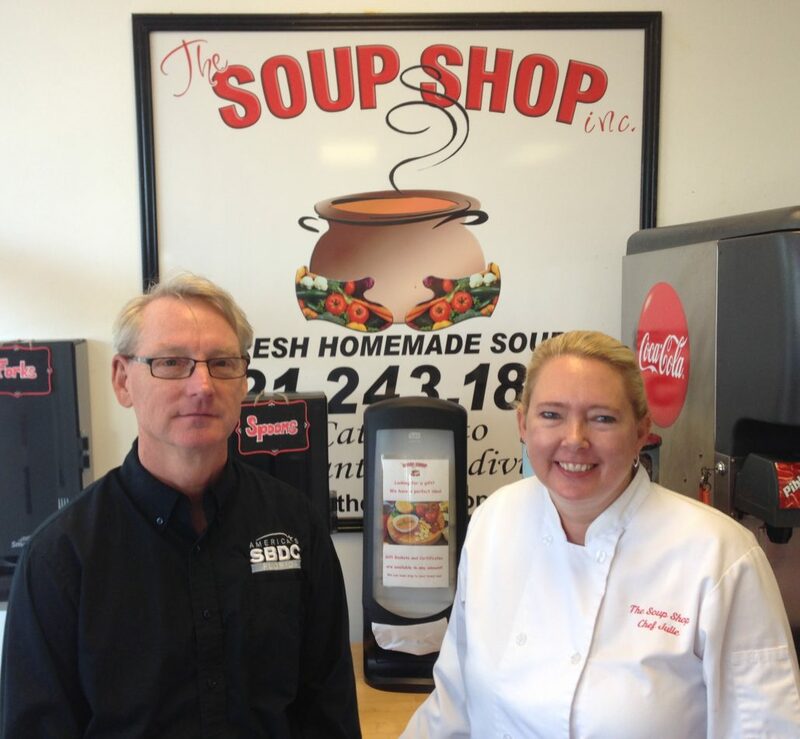 It was then that Shipley concluded that, as she puts it, “I didn’t know what I didn’t know” and decided she would seek assistance and learn how to make The Soup Shop not just popular but profitable too. Julie Shipley turned to the Florida SBDC at Eastern Florida State College (FSBDC at EFSC) and FSBDC consultant Marty Duffy for help. She attended FSBDC business seminars and workshops, and took advantage of the FSBDC’s confidential, no cost expert consulting by meeting with Duffy on a regular basis. Together, Shipley and Duffy worked to build a financial management system that would help her understand her business better. They put together a process in which the accounting system was tied to the point-of-sale system and the bank statements were integrated in a congruent manner to produce financial data in a timely fashion. Then Shipley learned from Duffy how to read the numbers and understand what they were telling her. Now she was able to make business decisions based on hard data and to forecast the impact of those decisions on the bottom line. “Thanks to what I learned from Marty and the FSBDC, I began to change my decision making process,” Shipley says. “I could make sense of my financial statements which prompted me to make a lot of changes in the way we operated that made us much more efficient than we were a year ago, and much more profitable, too.” And the numbers bear Shipley out. Revenues are up 24% year-to-date; The Soup Shop is growing faster than the market; and overall profits have grown 238% year-to-date. With its main office in the National Entrepreneur Center located at the Fashion Square Mall in Orlando, the Florida SBDC at the University of Central Florida (FSBDC at UCF) is part of the UCF Office of Research & Commercialization and the Florida SBDC Network (FSBDC Network). THE FSBDC at UCF provides business seminars and no-cost, one-on-one business consultation to emerging and established businesses. The FSBDC at UCF serves an eight-county area that includes Brevard, Flagler, Lake, Orange, Osceola, Seminole, Sumter, and Volusia counties and maintains 10 service centers across Central Florida. In 2015, the FSBDC at UCF served almost 7,000 entrepreneurs in Central Florida through consulting and training, resulting in more than 7,300 jobs created, retained or saved; $990 million in sales growth; $74.4 million in capital formation; $101.7 million in government contract awards; and 111 new businesses started. The FSBDC at UCF is a member of the Florida SBDC Network, a statewide service network funded in part through cooperative agreements with the U.S. Small Business Administration, Defense Logistics Agency, State of Florida and other private and public partners. The Florida SBDC Network is hosted by the University of West Florida and is nationally accredited by the Association of SBDCs. All opinions, conclusions or recommendations expressed are those of the author(s) and do not necessarily reflect the views of the SBA. For over 35 years, the FSBDC Network has nourished a statewide partnership between higher education and economic development organizations, dedicated to providing emerging and established business owners with management and technical assistance, enabling overall growth and increased profitability for the businesses and economic prosperity for the state. The FSBDC Network is a statewide service system of 41 centers with 60 outreach locations, including the FSBDC at UCF. In 2015, the Florida SBDCs served almost 45,500 entrepreneurs and small business owners through consulting and training, resulting in 217,849 jobs created, retained or saved; $29.3 billion in sales growth; $947.4 million in capital accessed; $2.1 billion in government contract awards; and 3,857 new businesses started.